Art is something I’ve always gravitated towards. While I sometimes have a hard time understanding crazy gallery displays, I tend to dabble in my own creations. Let’s just say I’m known for taking on some ambitious art projects. Since “I’m from Pittsburgh” (that’s for you Brian), I’ve always had an interest in Andy Warhol’s work. I think it’s a combination of the photographs, fashion and bright colors. So you can imagine my overwhelming excitement when I saw these new bottles of Dom Perignon inspired by Andy Warhol. 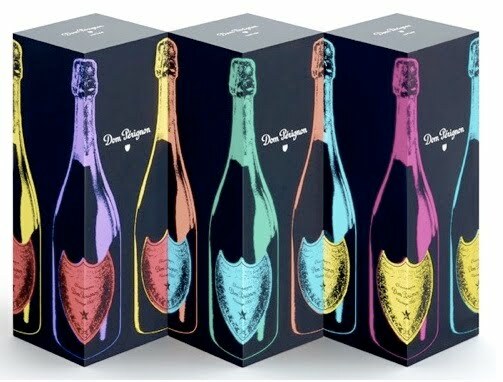 "a club of twenty guys who got together and they're going to buy 2,000 bottles of Dom Pérignon which they will put in a sealed room until the year 2,000 and then open it up and drink it and so the running joke is who will be around and who won't..."
Dom Perignon will release limited edition Andy Warhol-inspired beginning October 15th. While the $150 price tag is a bit steep, think of it as an awesome conversation piece for your bar and a cool bottle to break out during a celebration. Maybe after painting a room! ?